Here we offer 20th Century Non-Firing handguns. They are great as theatrical pistols, collector’s handguns or display weapons or wall hanger Weapons. These in this category can NOT fire Blanks. Our Replica 20th Century museum quality Replica Weapons include Mac 11, Desert Eagle, 357 Magnum, colt 45 1911, German Luger, M3 Grease gun, M 92, Colt 45, HP Replica Pistol, 1896 Mauser, Webley Revolver, P08 Luger, P38 Luger, Soviet Makarov Pistol and German PPK. These Replica Guns in this Category are NON FIRING. They do not Fire Blanks or Caps. Sling for German WWII Submachine Gun: This all leather sling fits our Item No. 22-1111, German World War II Submachine The Gun is Sold separately from replica gun shown. You only get the sling shown for the $28.00. Non-Firing Decorator P-38. Reliable, automatic pistol that replaced the Luger. Slide action works, clip does not release. Features: Length: 8.5 Weight: 2.5 lbs. This historic British revolver is uniquely represented in this non-firing replica. The action works just like the original, with working parts and moving action. Features: Overall Length: 10.25" Barrel Length: 5" Weight: 1.75 Lbs. 357 Police Magnum 6" Barrel Replica Non Firing: Our new classic police style high power magnum features include a 6” barrel, swing out six shot cylinder and working double action. Features: Length: 11”, Weight: 2.3lbs. 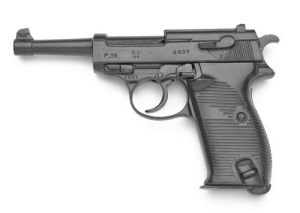 Barrel: 6"
The Soviet Union's standard military side arm from 1951-1991. This highly collectible, non-firing replica of the famous Russian semi-automatic pistol features exacting detail and the specifications of the original. Overall Length 6.34", Barrel length 3.83"